Mr. Marieo Foster serves as the Chief of Police and Director of the Office of Public Safety and Emergency Management (OPSEM). 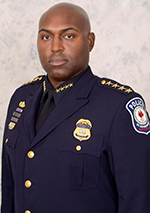 In this role, Chief Foster has executive oversight for the law enforcement, public safety and emergency management functions for the entire university system. Chief Foster has over 27 years of law enforcement, security and antiterrorism/force protection experience in both government and industry, he has completed operational and management assignments all over the United States rising in rank and responsibility from patrol officer, ATF K9 handler, federal agent and Chief of Police. Chief Foster holds a Bachelor’s Degree in the Administration of Criminal Justice from the University of Charleston, a Master of Arts degree in Public Safety and Law Enforcement Leadership from the University of Saint Thomas, is a graduate of the 271st Session of the FBI National Academy, is a course graduate of the Army’s Staff Management College, and is a graduate of both Basic Police and Criminal Investigator Training Programs at the Federal Law Enforcement Training Center, and the United States Army Military Police School. During his time as a United States Army Military Police Officer, Chief Foster served as a Tomb Guard at the Tomb of the Unknown Soldier in Arlington National Cemetery and was a member of the US Army’s elite Presidential Honor Guard unit, The United States Army Drill Team before being honorably discharged from active duty service.